Live With Kelly: Who is Reggie Bush Dating? Does He Have Tattoos? The Miami Dolphins’ Reggie Bush joined Kelly today as co-host, and the first topic that came up was the topic that has been on everyone’s minds since yesterday: the untimely death of Disco Queen Donna Summer. Kelly said that Donna was a lady that truly “defined her life,” and that most of the music that she owns is Donna’s. Reggie said how much his mother loved Donna Summer, so he was very sad to hear of her passing from lung cancer at the age of 63. Kelly expressed how frustrated she is that cancer is still taking away people’s lives, saying, “enough with the cancer, already,” and she wished that a cure would be found soon. Reggie lightened the mood by talking about his night out last night, where he went out with some friends and watched the Miami Heat game. Kelly asked if by “friends,” Reggie actually meant, “girlfriend.” He laughed but she continued by asking him if he was single, to which he replied uncomfortably, “I’m dating.” “So you’re narrowing the field?” Kelly asked. “Let’s talk about the next thing…” Reggie responded. Looks like he’s got something going on, after all! Kelly went to see Maroon 5 in concert with her daughter and a couple of friends. When she received applause, Reggie asked, “why does your night get applause but not mine?” Kelly said the audience applauded because they were just happy that she left her house! Kelly highly recommended seeing Maroon 5 perform live, and said that singer Adam Levine’s voice sounded “incredible.” She and Reggie talked about the struggles of the music industry versus the world of athletics. Kelly pointed out that, if you’re a strong athlete, you have more opportunities than the countless strong musicians who may never get their big break. Reggie said he doesn’t know anything about that stuff, because he can’t sing. Kelly asked Reggie if he had ever “sexted,” and he gave an honest answer, responding, “Everyone does, right? It’s not just me!” She brought up the previous story she had mentioned about the age limit for texting; people under 34 use texting to turn each other on, while older people like to be wined and dined. They decided that texting is a generational thing. Kelly showed a picture of a new, $35,000 dollar shower that you use laying down, while jets shoot the water down from above. She emphasized that the shower does not come with the naked girl in the picture. She said, as a woman, “that could be a lot of pressure,” then paused and added, “or a lot of fun.” She joked that Mark would have to come get her out of the shower after seven hours. At one point, Kelly said she stopped hearing what Reggie was saying, just because she loved him so much. She said that she wanted to wear an “I love Reggie Bush” t-shirt, but Gelman wouldn’t let her. It turns out that Reggie did not have a t-shirt like that for her, but he did have something better: a Miami Dolphins “Ripa” jersey. She said that she would sleep in it every night. 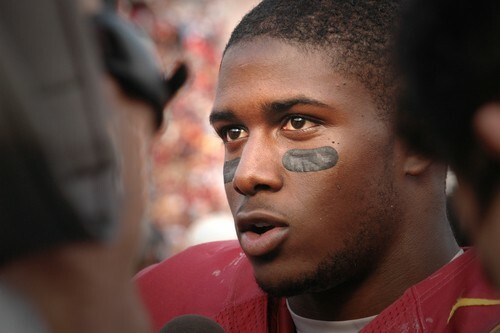 Does Reggie Bush Have Tattoos? Kelly pointed out that there is a tattoo convention in midtown this week, and asked Reggie if had any tattoos. He said that his brother and a lot of his friends have them, but he doesn’t because he never had the desire to. Kelly admitted that she does have a few, but was playing very coy about it. Reggie then asked Kelly if she liked guns, and she said no way. She said that she once went to a shooting range in Las Vegas and was “horrified.” She found it disturbing that her son, who was 8 at the time, could not walk through the casino but could be around dangerous weapons. Reggie brought a funny Youtube video that he had found that garnered big laughs from the audience: a husband, sick of telling his wife to stop messing around with guns, snuck up behind her one day and set off a bunch of firecrackers. Of course, she freaked out, dropped the gun, and ran away in terror. As Kelly and Reggie were discussing the show ahead, Kelly mentioned that a lot of people on Twitter were saying that they hated Top Teacher Week, because they could not choose between all the great teachers!